Female Pattern Hair Loss occurs in about 50% of women and is inherited from either side of the patient’s bloodline. In some cases hair loss may skip generations and not affect parents, however, in most cases someone in the family can be identified with some degree of hair thinning at some point in their lives. Pattern hair loss is actually a process of progressive miniaturization of follicles, driven by an abnormal response to hormones, which produce a smaller hair over time; in other words, the follicle is not lost, just smaller. 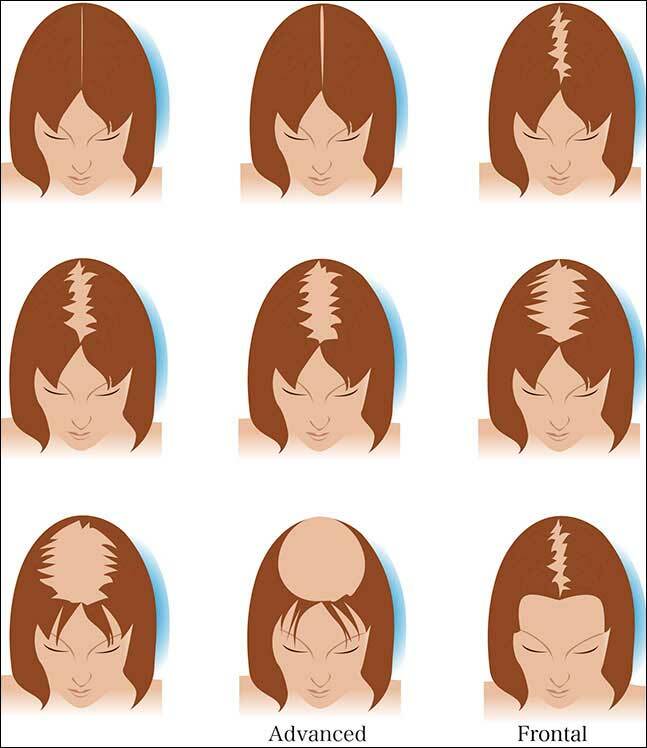 Female pattern hair loss usually begins as a noticeable widening of the part line with some recession of the hairline, especially in the temple area. As time progresses, there is variable expression of the gene such that there is progressive thinning mainly on top of the head at variable rates of speed. There may or may not be noticeable shedding. In some cases, there is more diffuse thinning not only on top but also on the sides and in the back of the scalp. Treatment of female pattern Hair loss involves both medical and surgical approaches. Unlike in men, there is not a reliable oral medication for women to treat hair loss. In men, where the hormonal target is DHT (dihydrotestosterone), Finasteride is an effective oral medication for the preservation of thinning hair. No such well-defined target hormone is yet known in women where it is thought that multiple hormones may be at play. Aldactone is a diuretic drug with anti-androgenic effects which is often prescribed in women and which may help to some extent in combination with topical medications like Rogaine®. Vitamin supplements like Biotin are also helpful as are iron supplements in women who are iron deficient, which may contribute to thinning. Ruling out and treating underlying medical problems such as thyroid disease is also important. While medical treatments are important in maintaining and stabilizing hair loss, and in many cases markedly improving it, ultimately, the most effective way to thicken the hair in women is by Hair restoration surgery. Most women are good candidates for hair restoration surgery because they generally have mild to moderate thinning, an intact hairline, and adequate donor hair in the back of the head. As in men, hair restoration surgery involves removing hair follicles from the donor area in the back of the head and transplanting or grafting them to the recipient area in the hairline and top of the head. Harvesting from the donor area can be done using one of 2 techniques: 1. Strip Harvesting where a strip of hair-bearing scalp is removed from the back of the head and then sutured closed, and 2. FUE, Follicular Unit Extraction, where individual follicular units are extracted using the ARTAS robotic surgery device in Dr. Griffin’s practice. Both techniques yield follicular units for transplantation. In both techniques, tiny incisions are made in the recipient area into which are placed the grafts containing new hair follicles. Women may prefer the strip technique because, unlike the FUE procedure where the entire donor area is shaved, only a narrow strip of hair is cut short for removing the donor strip, which is then covered with hair. This will leave a linear scar which is invisible when covered with hair. With the FUE procedure, there is no linear scar which allows for a shorter hairstyle. Both techniques result in a natural appearance of the transplanted follicles. In both techniques, the new follicles produce a new hair 3-6 months post op. The hairs will continue to grow for one’s lifetime. In most cases, more than one procedure will be necessary the completely correct the area of thinning. We generally recommend at least 2 procedures although women have the option to wait and see how the new hair looks after it is grown in before deciding to do another procedure. We like to wait at least 6 months between procedures to let the previous follicles grow in before doing the next. Post operatively, after either a strip procedure or an FUE, post-op instructions are given which will help in the ​recovery and healing of the new follicles. Scabs or crusts will form on the new grafts which are best soaked off. Swelling may occur on the forehead and around the eyes which is temporary. After a strip procedure,​ there are sutures to be removed, which is not the case with FUE. Generally speaking, a week is required for healing after which resumption of normal shampooing is allowed, as is normal exercise and activity. The procedure is very well tolerated. Contact Dr. Griffin’s office for a hair loss consultation. It is better to begin treatment earlier than later, though it’s never too late to do something about your hair loss.